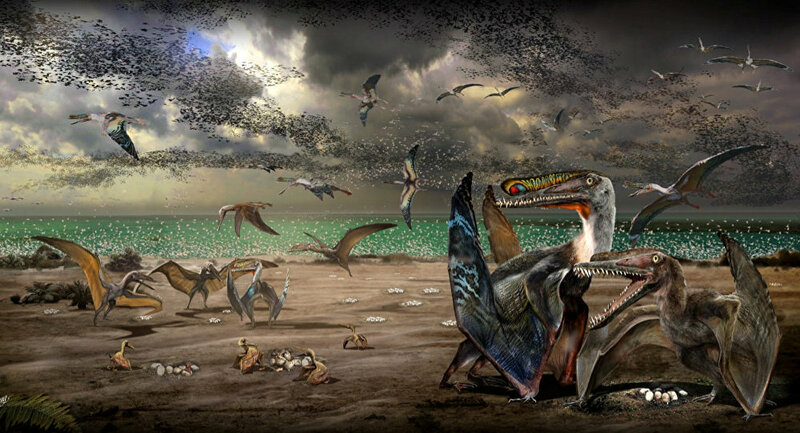 The over 200 preserved pterosaurs eggs unearthed in China, offer new insight into the life of the rulers of the skies in the age of dinosaurs. The findings on the pterosaur species, known as Hamipterus tianshanensis, were published in the journal Science. The virtual treasure trove of eggs laid millions of years ago, gives scientists a unique chance to cut them into cross-sections to study growth rates. Even better, 16 of the 215 miraculously preserved eggs found in China’s Turpan-Hami Basin in Xinjiang contain embryonic remains of the pterosaur species, which means that scientists now have more information about how pterosaurs progressed from egg to adult than ever before. The researchers believe that there could be as many as 300 more eggs within the same sandstone block. — The New York Times (@nytimes) 1 декабря 2017 г. ​The pterosaurs were flying reptiles that went extinct about 66 million years ago. Just a handful of pterosaur egg fossils have been discovered to date, and only six have not been completely crushed under layers of sediment.